Compressor settings can be confusing at first. 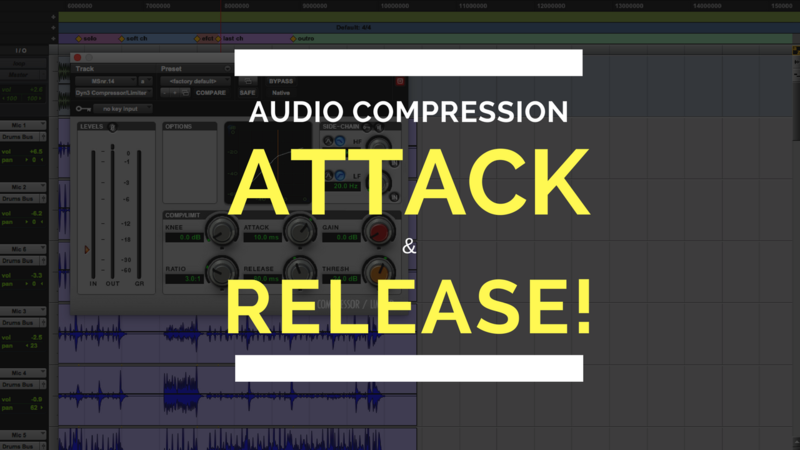 In part 2 of this video series (below) I want to dive deeper into the compressor settings of the Attack and Release. These 2 knobs will have more to do with shaping the tone and sound of your audio than any other compressor settings. The attack just tells the compressor how fast or how slow to clamp down on the audio once it’s past the threshold line you’ve set. A faster attack can help tame those really aggressive audio peaks from snare drums or a loud vocal part. A slower attack can let things poke through a little more in a mix and keep those aggressive elements cutting through. For example an acoustic guitar getting lost in a dense mix. You could set a slower attack to let the initial attack of the down strum of the acoustic guitar cut through the mix. The release just tells the compressor how fast or how slow you let go of the audio afters it’s clamped down on it. So if you wanted to tame the initial attack of a snare drum hit, but have the sustain ring out you could have a fast attack and fairly fast release. The fast attack will turn down the loud initial transient of the stick hitting the snare drum, then let go quickly so that the tail end or sustain of the snare sound can ring through without being turned down. If you wanted more attack of the snare, you could set a slower attack and slower release so that the compressor lets the transient come through then grabs onto the tail end and hold on for a while so it’s not as loud or over emphasized. These are just 2 examples of what you can do with the attack and release compressor settings . The MOST important thing is to USE YOUR EARS. You will have to play around with these knobs to get the desired affect you are looking for. The best way is to just play around with a compressor and get a feel for what it can do. Don’t be afraid to use a preset on your DAW’s stock compressor plugin to get you in the ballpark. Those presets are not set in stone so don’t be scared to mess them all up and get a completely different sound. I hope this helped you get a better understanding of how the attack and release knobs can affect your audio. Leave a comment and don’t hesitate to share this article if you think it will help someone. To see part 3 (using 2 compressors) in this compression series click here. Pingback: What is Audio Compression And How The Hell Do You Use it? !